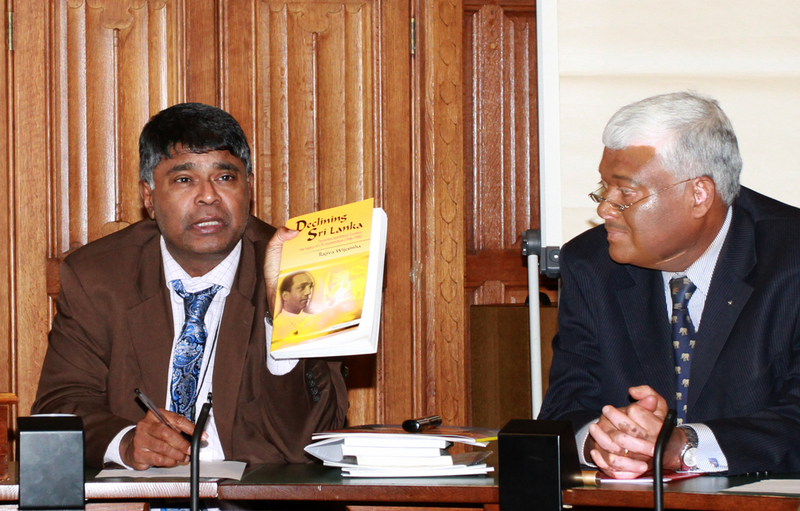 Closing comments by Prof Rajiva Wijesinha, MP at a meeting of Sri Lankans in the House of Commons on October 14th 2010 to discuss future reconciliation issues. First let me thank all those who attended, and raised issues. What I think the discussion highlighted was that in fact there are few major issues that are problematic. If indeed we think back to what was being said a year ago, we realize that government has in fact dealt very well with potential problems. For instance it was claimed then that we were trying to keep the displaced, 300,000 of them, in long term prison camps. On the contrary, almost all of them have returned now to their places of origin. The exceptions are those in Jaffna, where we still have some High Security Zones, though these are being reduced, and a few people in Vavuniya. Many of these are people of Indian origin, and I should note that the manner in which they were neglected in the past is something we should remember. I remember that, when the displaced first began to come through from the Vanni, and there were allegations that the camps we had prepared were sub-standard, I went up to look at them and found them comparatively comfortable . What horrified me were the camps in which earlier displaced persons were kept, the Muslims the LTTE had expelled from the North in 1990, people of Indian origin in camps such as Poorthottam in Vavuniya. Sadly there had been nobody to speak for them earlier, and it is all to the good that we are able now to address those problems as well as the larger scale problem of the people the LTTE had tried to keep hostage. Then another allegation was that we were ill-treating the former combatants, the 10,000 who had surrendered on their way through. On the contrary, about 3,000 of them have been already released, and most of the rest will be home by the end of the year. Indeed I found, having decided to use part of my decentralized budget as an MP, to provide English primary teacher training for some of them, that they will not be in the camps beyond this month or the next – fortunately we will continue to help them, so I hope they can attend the training programme from home. We can then take pride in what must be one of the swiftest return programmes for internally displaced people, what must be one of the most humane rehabilitation programmes. Typically we have not received congratulations for this from those who expressed fears before, but at least the tales of woe they propagated have died down – as have the stories of sexual abuse and so on, as to which we can proudly claim that the record of our forces is about the best in the world for such situations. And there has been more. The rapid development of infrastructure in the North parallels what has been achieved in the East, in terms of setting the scene for the more equitable development the country needs. For we must be honest and grant that it was lopsided development in the past that contributed to so much resentment. It is true that this affected areas in the South too, which is why we also had two Southern youth insurrections, but we cannot ignore the sense of grievance by those who felt that the North was neglected because its people had no voice in governments that paid attention to the Sinhalese who were their main constituents. In this context we should also register the deep anguish caused by discriminatory policies with regard to university education. I must point out here that the speaker who understandably enough expressed his anger had confused two separate issues. The first was the policy of standardization that was introduced in the early seventies. I have pointed out that that was not racist in intention, in fact it benefited Tamil students from rural areas as it was intended to, and as it benefited Sinhala students of similar backgrounds. But as we know, while it hit Colombo students hardest, they had alternative avenues, indeed those who joined the private sector ended up earning more than those of us who had degrees. The Jaffna students on the contrary had no such remedies, and we should remember that Mr Prabhakaran belonged to the first generation adversely affected by that standardization programme. Though its aims were not racist, it was implemented without sensitivity, and we should be sympathetic therefore about the grievances of those who suffered. The earlier speaker however confused that measure with something much worse, which was the reintroduction of standardization towards the end of the seventies, by the same UNP government which had abolished it with much fanfare as it came into power. The second stage arose after Cyril Mathew had made allegations in Parliament about Tamil examiners cheating, so that clearly, when the government acted, it was deliberately sending a very negative message to Tamil youngsters. It is no wonder then that the terrorist movements, which had been very small earlier, recruited many more youngsters during those years. Given the importance of this issue, and of education in general, we must move towards ensuring greater opportunities and also concentrate more on equity in education as a matter of urgency. Fortunately this is one of the government’s priorities now, and with dynamic programmes being initiated by not only the Ministry of Higher Education, but also the Ministry of Youth Affairs which has responsibility for Vocational Training, I believe we will soon make amends for the deficiencies of the past. In the process we will also ensure that the youngsters of the North, as well as those in the rest of the country, will be able to contribute actively to the enhanced economic activity that the rapid development programme will engender. Other areas in which we need swift action include effective implementation of the language policy that set right the injustice of a single official language which was not taught to many of our people. We now have two official languages and an education system that provides teaching of both, as well as greater attention to English so that we can ensure that our people are not encased in a monolingualism that prevents them communicating with each other. However I believe we can do better, and I hope we do not continue to treat the learning of these languages as compulsory in that peculiar Sri Lankan way that means they are not compulsory at all. We should make it necessary that, in addition to their Mother Tongue, students pass at Ordinary Level in at least one of the other languages. We also need to build up more schools in which students of different communities can study together, instead of continuing with enforced segregation through Sinhala schools and Tamil schools and even separate Muslim schools. As mentioned, this government took the initiative to make it compulsory for new recruits to the public service to gain proficiency in a second language. However this is not compulsory for old recruits and it is difficult to make the provision retrospective. Nevertheless a programme of training has commenced, and the President himself has given a lead by developing speaking capacity, which was never done before by any head of government. We also need to increase recruitment of minorities to the public service, and in particular to the security services. This has already begun for the police, indeed government began this even while the conflict was raging, and nearly a thousand police officials passed out from the new training school at Kallady in the East. But we could not publicize this properly because of the threat to them from the LTTE, which actively discouraged recruits, so that it was only after the destruction of the LTTE that large numbers once more applied. Several hundred more then will pass out shortly, and we should soon be able to recruit to the army too, as happened in the past. In this context let me note that one measure to increase confidence will be improved police training programmes. Whereas the army was able to increase its professionalism over the last decade, and is a disciplined force that has done better with regard to caring for civilians than any other army that has been combating terrorism, the police have been overwhelmed with a range of duties in the last couple of decades and had to cut short their training programmes. Now that the threat of terrorism which placed a massive strain on their resources has retreated, we need to increase training periods and pay more attention to community services and sensitivities. Senior police officials have been working on plans in these areas, and it may now be possible to fast forward these. Let me add too, in the context of the suggestions for greater accountability that we have finally begun to see a more collegiate approach in Parliament, with committees of all members functioning more actively. The Committee on Public Enterprises for instance, which was able during the last few years to look only at a small proportion of institutions under its purview, has now divided into sub-committees and already covered almost as many institutions in four months than appeared before it each year in the past. One reason for this is the stability we enjoy. For about twenty years, there was a sense that the main role of Parliament was to sustain or bring down governments, and the arithmetic of these years gave rise to much maneuvering. Now however there is a sense that Parliament also has other roles to play, in particular to discuss issues and monitor government activity without relentless confrontation. Of course these are still early days, but I hope we will be able to revive some of the Parliamentary practices of the past that have been in abeyance for so long. I am happy then that so many people with different viewpoints have contributed to this discussion. There is also a role for the diaspora to play in the exercise of rebuilding the country. In particular they can contribute to educational developments through expertise as well as support for new initiatives. That will help us with building up the pluralist prosperous society we deserve.